Credit for photo above: Denmarsh Photography, Inc. The Garden Club of Allegheny County awards grants based on community needs, membership interests, and the availability of GCAC’s resources or ability to attract these resources. In the past 24 years, GCAC has raised more than $1 million through Pizzazz proceeds to fund these grants. To see our Grant Recipients, please scroll down. Grant applications are accepted between September 1st and January 15th. Please see information about the application process by clicking the button below. The Botany in Action Fellowship (BIA) program, founded in 1995, awards fellowships to plant-based PhD students conducting research and outreach efforts in the US and abroad. With the proceeds from our Pizzazz Fundraiser, GCAC funds at least 1 fellowship grant each year in the name of BIA co-founder and GCAC member Paula Sculley. Elisabeth Ward, chosen as the 2019 Paula Sculley Fellow for Botany in Action, will study non-native invasive plant species and how they impact the soil in which they grow, even after the removal of their above ground vegetation. Eli’s research has implications for current invasive plant management practices as well as for the restoration of native plant ecosystems. Her fieldwork will take place in Connecticut and New York where she will focus on the impact of oriental bittersweet (Celastrus orbiculatus), multiflora rose (Rosa multiflora), and Japanese honeysuckle (Lonicera japonica). Eli is a doctoral student at Yale University. Allegheny Land Trust focuses on four strategic priorities – land conservation, stewardship, urban greening, and education. This grant supports the acquisition of a 38.5 acre parcel of land, trail side and creek side along the Montour Trail in Moon Township. The Audubon Society of Western PA connects people to birds and nature through their programs, projects and places. Through quality programs in environmental education and conservation engagement ASWP engages, inspires, and empowers residents of our region. This grant would help develop a K – 12 curriculum which promotes and distributes an all-inclusive pollinator conservation program. This successful program will expand to Lincoln-Larimer-Belmar and East Hills by installing a network of backyard raised-bed vegetable gardens at individual households so families can grow, harvest and share their crops within the community. The grant would allow Phipps to hire an individual from the Student Conservation Association for a 9-month period who would supervise and oversee this initiative. Landforce combines workforce readiness and environmental stewardship by hiring people who have barriers to employment and training them to work on environmental restoration and conservation projects across the region. Our GCAC grant would provide environmental stewardship training for 18-24 crew members over a 6-week training/probation period. Healthy Schools Pennsylvania, created by Women for a Healthy Environment, acts as a resource for the school community, including parents, staff, teachers, and administrators. This grant would engage 4th and 8th graders in Mon Valley to learn, interpret data, address, and assess air quality by using portable air monitors to track air pollution in their neighborhoods. The mission of the Aspinwall Riverfront Park is to create an independent, self-sustaining riverfront park that will be a community treasure and catalyst for trail expansion. The monies used from GCAC will be to remove crumbling concrete from outside the new Welcome Center along the River. The Children’s Institute is dedicated to improving the quality of life for children, young people and their families by providing a specialized continuum of services that enables them to reach their potential. The grant monies used will be to purchase specialized gardening tools and plant material in the Nimick Family Therapeutic Garden. The Mission of Grow Pittsburgh is to teach people how to grow food and promote the benefits that gardens bring to our neighborhoods. They use growing food as a platform to bring people and communities together, while inspiring them to be healthier individuals, learn new skills, care for the earth and make our city and region a more livable and desirable place to be. This is done thru a variety or programs. The monies for this particular grant will be used in the Urban Farmers in Training Program - in particular to fund the Youth Summit that take place with their summer program for youth ages 14-18. GTECH identifies opportunities for people and the places they live that improve the economic, social, and environmental health of communities. GTECH partners with community organizations, service providers and public agencies to develop and implement community-based strategies. The GTECH Green Stormwater Infrastructure project works using green solutions to create creative community spaces while reducing stormwater runoff thru outreach and education. GTECH has come up with a Green Stormwater Roaming Gnome as a persona to be a symbol of work happening with stormwater runoff. Our monies will fund 2 projects in 2 different locations in the A-42 sewershed neighborhoods. 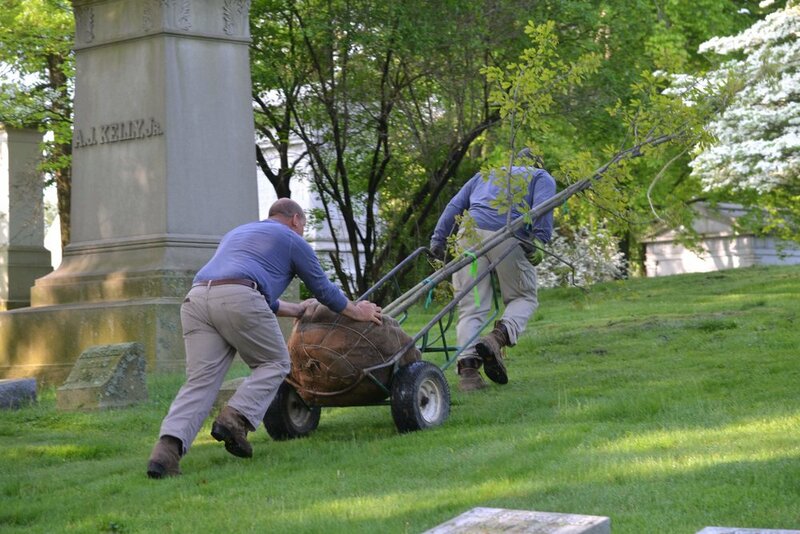 The Homewood Cemetery Historical Fund was organized to preserve and restore the history and architecture of the Cemetery. The Cemetery is preparing to celebrate the 100th Anniversary of the passage of the Women’s Voting Act in 2020. The Cemetery is the final resting place of many influential suffrage workers, including Mary Flinn Lawrence. The monies given to the Cemetery will be used to purchase 2 new trees on the Flinn lot (a Chestnut Oak and a Winter King Hawthorn). The Neighborhood Academy is an independent, accredited, faith-based college-preparatory school designed specifically to meet the needs of low-income youth. The school is dedicated to developing the minds, bodies and spirits of students so that become fully productive members of society. The monies requested will be used in the new middle school wing area of the school. The space needs landscaping. They plan to use the space as an “outdoor lab” for students to better study native plants, natural habitats and nature in general. There are specific plans for students in the 9th, 10th and 12th grade to utilize this green space. Ashley Cecil is an artist and illustrator based in Pittsburgh. With funding from New Sun Rising, a 501c3, whose mission statement is “to empower leaders in the Pittsburgh region through fiscal sponsorship, mentoring, and community building” Ashley Cecil plans to take her visual art practice and foster public collaborations with Phipps Conservatory and Botanical Gardens as she has done previously at the Carnegie Museum of Natural History and the National Aviary. These partnerships strive to engage the public in environmental issues affecting our health and well-being. With funding from GCAC, Ashley will be able to expand her 6 month Art and Science residency at Phipps to include additional workshops with children, demonstrations to visitors and participation in Phipps’ Biophillia Program. Support for a Botany in Action Grantee. To learn about this years recipient, click here. The mission of the Conservancy is dedicated to improving the quality of life for the people of Pittsburgh by restoring the parks system to excellence in partnership with local government and the community. Projects and programs are conducted with respect for the environment, historic design, and the needs of our diverse region. The grant request is for a planting bed around the Northeast fountain which is located in the northeast corner of Allegheny Commons. This is the third phase of the 2002 master plan. GCAC would like to honor our member Meg Cheever for all of her dedication to the Conservancy. The mission of the Student Conservation Association is to build the next generation of conservation leaders and inspire lifelong stewardship of the environment and communities by engaging young people in hands-on service to the land. SCA wants to continue the programming of Apprentice Crew Leaders who are students who have worked for SCA in the past and are ready for a leadership role. This is the second year of this program which had great success last summer. The monies given will fund 2-3 leaders for the summer 2018 Community Program. Tree Pittsburgh’s mission is to carry out fund-raising, education, and stewardship activities aimed at restoring and protecting Pittsburgh’s urban forest. The organization’s vision is to be a leader in creating a healthy and robust urban forest by engaging citizens to maintain, plant and protect trees. A program that has grown the past few years is the Heritage Tree Nursery to make greater availability of diverse tree species for Tree Pittsburgh as well their planting partners. The grants monies for Tree Pittsburgh will go to expand their irrigation system at the Nursery. Funding for an ecological assessment and action plan at Hartwood Acres Park. Support for the design of a rain garden and bioswale at the Carrick branch where a new library with an outdoor green space is being built. Funding for landscaping, including the removal of unhealthy bushes and trees, on the Flinn Lot in preparation for new plantings. Funding for crew members to complete projects such as the improvement of a vacant lot and/or outdoor classroom and a green stormwater infrastructure project. In honor of the Centennial of the National Park system, GCAC will support the installation of a Pollinator Friendly Landscape at the Tower of Voices at the Flight 93 National Memorial site in Shanksville, PA.
Support for a Botany in Action Grantee. Funding for five Apprentice Crew Leaders (ACL) in the community program during the summer of 2017. These ACL leaders are students who have worked for the SCA before and now wish to participate in a leadership role. Beautification of the long median on Route 65 near Route 19 and the West End Bridge. Monies will be used for perennial plant material and its installation. "Citizen Science on the School Ground," a school-focused program where students create a wildlife garden that benefits people and native species. Advancement of green infrastructure in coordination with Pittsburgh Job Corps Center. Installation of a public education exhibit including a native plant rain garden with a bridge. Planning and design of the Native Plant Discovery Gardens at the Frick Environmental Center. Funding for a Community Youth Program to support a recreational camping trip in Allegheny National Forest, and for a Point Park Conservation Crew to hire 10 Pittsburgh high school students to help restore the landscape, remove invasive species and trash, and maintain the GCAC Bioswale. Integration of youth services and educational programs into the community tree nursery program. In conjunction with KDKA, installation of a weather data collection station at the camp which will allow thousands of area participating school children to access the data for incorporation into their science programs, and also support a summer co-ed STEM science camp. A garden on the ground of Hampton HS to commemorate alumni, and incorporate horticultural education opportunities for current students. The GCAC Grant will fund engraved brick(s) for the memory walkway. For 20 years, this group has held a speaker's series, and with the proceeds, implemented a multitude of community horticultural services, and educated thousands of local citizens annually with outreach programs and community food gardens. The GCAC Grant will underwrite the cost of the conference speaker honorarium. Joint project to renovate an 87-acre park south of the city in a blighted neighborhood, and make it a safe, usable, and attractive green space for a number of neighborhood programs. A plan to strengthen the ongoing Urban Ecostewards program is incorporated. Funding for garden of authentic plants representing Paradise imagined through the ages, from the "Hanging Gardens of Babylon" and the Egyptian pleasure gardens, to the Renaissance. To create one large fully planted circular “raindrop” garden to show case native plants and educate the public about them. Appropriate interpretive signs will be used within the garden to educate the public about native plants. To be used to develop Phase II of The Outdoor Classroom at FHNC. To support Edible Schoolyard Pittsburgh, an in-school gardening program that is geared towards grades K-5. To pilot a new initiative “Knot on Lots” to test the feasibility of using Japanese Knotweed as a feedstock for locally produced paper products and biochar that can serve as a soil amendment while engaging the community in vacant lot cleanup and product production seminars. To be used to provide window boxes for homeowners in Lawrenceville who have been denied trees through TreeVitalize. For historically accurate and non-invasive plant materials for landscape enhancements and improvements to the grounds of Woodville Plantation. To fund one Phipps-GCAC Botany in Action fellow for one year. To create one 400 square foot native plant rain garden and featured bridge to educate the public on the importance of native plants and the role of rain gardens. To support the planning and design of the Native Plant Discovery Gardens, part of the $15,950,000 Frick Environmental Center (FEC) project. To Support for the recreational trip component of the 2014 Community Youth Program, allowing 90 crew members and 18 crew leaders to camp over a long weekend in Allegheny National Forest. To support plant-based research funding for a PhD student conducting research as a Phipps-GCAC BIA Fellow. To integrate youth service-learning and public education activities into its community tree nursery program. To support research, conducted by Dr. Cynthia Morton, to analyze the genetic diversity of maple tree populations in the Pittsburgh area. To create a Master Plan for the complex 180-acre former Pittsburgh Cut Flower property that ALT has under contract to purchase. To support a project, in coordination with the Pittsburgh Job Corps Center, to further advance the use of green infrastructure. To support Phase II implementation work of the Fort Pitt Tunnel Garden; the upper-most bed on the airport-side of the Fort Pitt Tunnel. To support the beautification of a portion of RPH’s frontage and to expand the horticultural interest of their residents and the broader community. To support the purchase of plant material to be used to establish the new Garden of Hope. For the Hill House Park Volunteer Program. To support the restoration of Allegheny Landing Park. To enhance the Dogwood Meadow. To support the planting of 3 sunflower gardens on blighted, vacant City of Pittsburgh lots. To support the purchase, planting and related signage of native tree species and to help start two edible schoolyard gardens. To support the planting of 300 seeds at the Sewickley Heights Borough Park. To support Branch #1 (Sewickley) and support education coordination. Contribution to the Dene Summer House landscape at the 69th street entrance to Central Park in NYC. For the planting and maintaining of the stone planters at Schenley Plaza in Oakland. For the summer conservation crews with Pittsburgh area students. For perennial plantings in 16 Pittsburgh neighborhoods. For materials to complete the loop trail over Guyasuta Run. Planting material for a Therapy Garden in Swissvale. For the Urban Park Sustainable Landscape Plan for the Northeast Fountain Beds. For an intern to develop the volunteer component of a Garden at every school. To complete matching grant with DCNR Growing Greener for the expansion of the Three Rivers Heritage Trail to connect with the Montour Trail via the county’s Sports Legacy Project. For the Educational Brochure describing the Marsh Machine Project. Botanic Garden of Western Pa. Planting of Native Trees, Osborne Trail and Park, Inc.
Winterscape Project, Osborne Trail and Park, Inc. STEP One Conference (Solving Today’s Environmental Problems) International conference attended by 1200 registrants, promoting the ideal that individuals can make a difference in solving Earth’s environmental problems.